We are swiping Europe after transit systems connecting their neighbour countries like this one about the tram system in Basel, Switzerland here. It is an environment friendly way of traveling and Metro Donostialdea is a totally new service in northern part of Spain. You can reach San Sebastián with train from Bilbao, where this new metro alike section is located. Euskotren English service is very limited, so Distrita explains to you in this article about how to experience a unique area of northern Spain with a local train line that is now converted to a Metro alike service. The map below shows how far you can go in the area and you can also see Hendaia, which is on the French side of the border crossing between Spain and France. In August 2012, Topo (“topo” word in Spanish stands for “mole”) was the name of the line that Euskatren changed to Line 1. 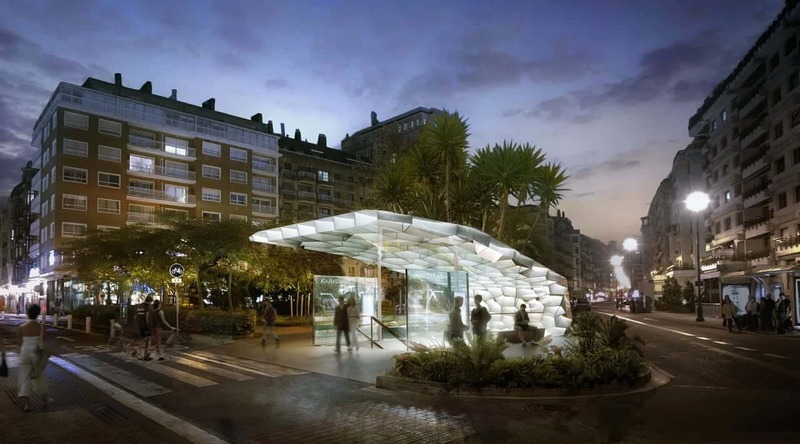 It is now part of the new Metro Donostialdea which is planned to be extended in the region. The line runs underground in San Sebastián between Amara and Herrera. In this area the line is also been described as Metro San Sebastian. Also a nice thing to know is that the totally new underground stations is designed by the Norwegian construction design company called Snøhetta. The Metro entrances simply looks stunning to look at. The design is based on a continuous movement from under ground level to over ground, and visa versa. The design element goes from being a ceiling structure under ground to create a roof structure over the stairs and up over ground. The structure describes the transition between the two states and connects the city life with the metro world. The signage and wayfinding system are an integrated and communicative part of the Metro stations. We performed a valuation of signage levels at varied distances, in addition to electronic and interactive LED displays with color coded hierarchy for train times and timetables. Directional icons, integrated into the structure itself – as well as site markers – indicate station location from a distance. These, along with visual accessibility, are the design criteria for highly legible and comprehensible urban metro station environments. All of the stations in-between are underground stations. They were all done in 2012 and is today built. Stunning looking. Also there is a local Metro line that stops at Altaza after Herrera station. There has been several plans to expand and launch a Line 2, but nothing yet is put into action. The frequencies in San Sebastán are every 7.5 minutes at peak hours. This is the reality between the Amara and Herrera stations. Then it is 15 minutes in the rest of the line, and 30 minutes for the end parts of the line. On this video above. You can see get a glimpse on how the underground stations between Altza that meets the main Line 1 line at Herrera and Amara looks like. Line 1 is connecting San Sebastián in Spain with Hendaye in France as seen on the map above here. Here you can change to TGV and other French railway lines. Line 1 by Euskotren acts like a local train line, but the type of platforms and wagons is way more Metro alike. They are the same that goes to Altza, so do not get confused. Read the signs on the train! Wow! See Rio De Janeiro from the air!